Filled Bottle Conveyor System is Well Machinery’s according to customer’s factory,customize the air conveyor, conveyor system, reasonably use the pressureless transmission, automatic bottle dividing device and other equipment, to improve the efficiency of filling production line during production process without blocking bottles, squeezing bottles, and falling bottles ,etc. 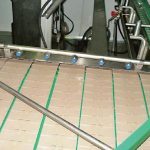 The filled bottle conveyor system connects the filling equipment and various packing machines for conveying bottled drinks in order to complete the final product packaging. It has the characteristics of stable and reliable conveying, advanced and reasonable electrical control of the real bottle conveying system, and diverse control methods. According to its different plane design requirements, it puts forward a practical control method to achieve the purpose of smooth transportation. Its compact structure is of low noise and is easy to operate. 1. Stable conveying, using synchronous chasing control between the conveying belt and engine, making bottles in good condition in the conveying: Non-falling, non-block, non-jam. And the cushion platform can be set before labeling machine, when the label is changed, the filling machine can keep working, no need to stop and waiting. The filled product during this period will be stored by the cushion, when label changing is finished, labeling machine will label the stored product in a high speed, and producing speed recovered. 2. Conveying belt is designed by module, component can be interchanged easily, structure is compact, noise is little, easy assembling and maintaining, have flexibility to combine the bottle type according to the different capacity. 3. 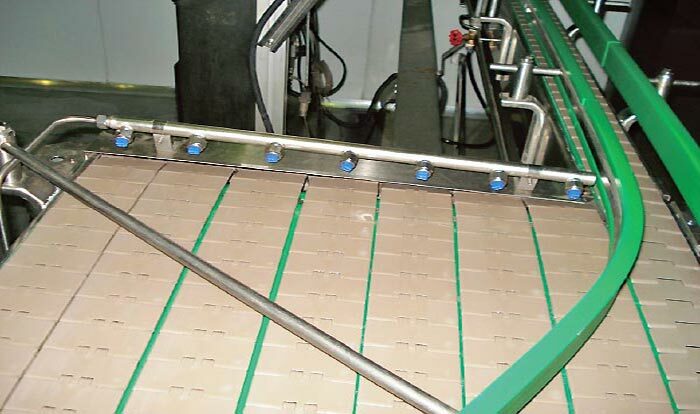 The design of filled bottle conveyor system electrical control is advanced and rational, we can design the control method, select the electrical control component according to client’s layout, to improve the conveying stability. 4. Switch according to conveying system layout or customer reasonable requirement, for the convenience of operation. 5. Belt lubricating system is equipped.